ILYLAS | What Does ILYLAS Mean? ILYLAS means "I Love You Like A Sister". The abbreviation ILYLAS can be considered a huge compliment between two female friends or a diplomatic way for a boy way to make it clear that he has no interest in a romantic relationship with one of his female friends. In the latter context, it is sometimes used as a response to the abbreviation ILY and other such declarations of deep affection. 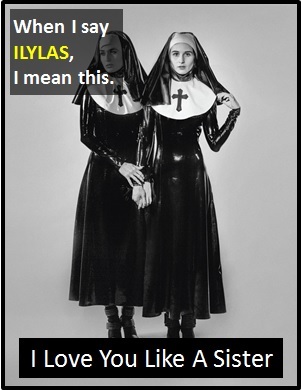 Of note, The abbreviation ILYLAS can also be written as LYLAS and LULAS, both of which mean "Love You Like A Sister". "I Love You Like A Sister"
Karen: You are my very best friend. I don�t know what I would do without you. Cheryl: You are very special to me too. ILYLAS . Trish: I don't know what I'd do without you. I think I love you. Carl: Thanks Trish. I am very fond of you too. ILYLAS . ILYLAS is an initialism abbreviation. Technically, this means it is pronounced using its individual letters (i.e., Aye Ell Wye Ell Eh Ess), but as this is harder to say than "I Love You Like A Sister", it is not often uttered using its letters. In other words, the abbreviation ILYLAS is for efficiency in writing and not efficiency in speech. The abbreviation ILYLAS is normally used as a standalone declarative sentence (i.e., a statement) with the meaning "I Love You Like A Sister". ILYLAS is not often used as another part of speech within a wider sentence. Before the digital era, we might have just said something like "I Love You Like A Sister" instead of using the abbreviation ILYLAS.